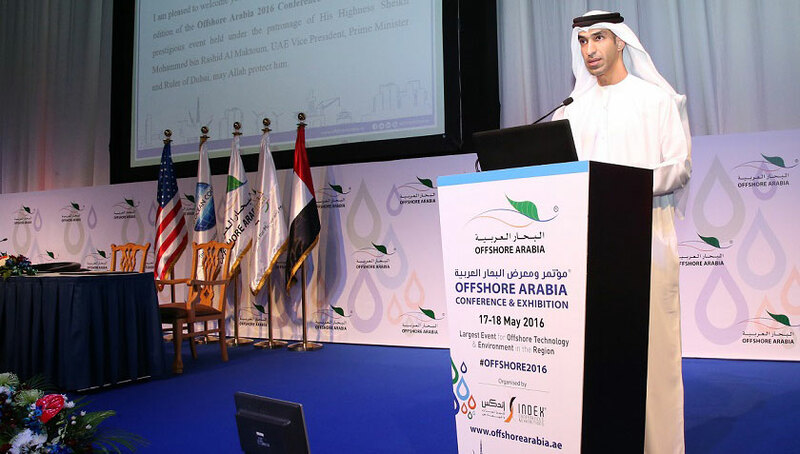 Dubai-UAE: May 17, 2016 – His Excellency Dr Thani Al Zeyoudi, UAE Minister of Climate Change and Environment, today inaugurated the eighth Offshore Arabia Conference and Exhibition at the Dubai International Convention and Exhibition Centre. The event has convened under the theme “Innovate – Adapt & Evolve An Eye on the Current Situation & the Other on the Future”. His Excellency Dr Thani Al Zeyoudi was accompanied by a number of officials, specialists, and keynote speakers from the region and the world. Following the opening ceremony, His Excellency Dr. Thani Al Zeyoudi toured the exhibition area and met representatives from various participating companies specialized in the marine and maritime industry. “Other areas of interest and important topics would be the media’s role in shipping, public relations and crisis management, financial crises and new trends in banking, security of critical infrastructure, airborne advanced surveillance, the newly updated state of the art metocean dataset for the Arabian Gulf and oil spill and crude oil tanker route monitoring systems,” he added. “Yes, times are challenging but businesses do innovate and regenerate themselves if they have the right environment. The real Big Bang is the planned Saudi Aramco IPO which is looking into a 3-way listing in New York, London, and Hong Kong. The listing of only 5% of the company, which could raise US$100 to US$150 billion, could have a tremendous positive change to the GCC region economy and future investments in all sectors of economy,” he concluded. “Offshore Arabia Conference & Exhibition has become the ideal platform for innovation and networking amongst various specialized companies and organizations working in the field of marine and maritime. This year, the event witnesses the participation of 100 companies from over 23 countries displaying their latest technologies and solutions,” he said. On the sidelines of the opening ceremony, a memorandum of understanding was signed between the Dubai Council for Marine and Maritime Industries (DCMMIemirates) and the World Ocean Council (WOC). The MoU was signed by Paul Holthus, President and CEO of World Ocean Council (WOC), and His Excellency Mr. Khamis Juma Buamim, Chairman of Dubai Council for Marine and Maritime Industries. The agreement aims to promote corporate ocean responsibility, ocean sustainable economic development, and responsible ocean economic activity. Offshore Arabia Conference and Exhibition is held under the patronage of His Highness Sheikh Mohammed Bin Rashid Al Maktoum, Vice-President and Prime Minister of the UAE and Ruler of Dubai. The two-day event is organised annually by INDEX Conferences and Exhibitions Organisation Est. – member of INDEX Holding at the Dubai International Convention and Exhibition Centre.